If you are trying to select a pair of cool looking earrings for men, but you don’t have the necessary time to do the research on this particular topic, we are here to help. After reading plenty of informative articles on the subject, we have composed a list of products that you might want to take a look at before you place any orders. So, keep reading and see what models are safe for your ears and worthy of your attention. If you want to purchase a product made from stainless steel, check out the model sold by Feramox. This unit was built from surgical steel and, as a result, it is both hypoallergenic and very comfortable for those that happen to have sensitive ears. When shipped, the item includes five different sets of earrings that come in distinct colors. On top of that, each unit has a gauge size of 1.2 mm. According to the manufacturer, this product is suitable to be used by both men and women of all ages. Additionally, keep in mind that this product meets and exceeds the F.D.A / E.C requirements. If you want to buy a great gift for your geeky friend, this model designed by Star Trek might be just what you’ve been searching for. Just like some cool industrial earrings, this model is made of gold and silver-toned stainless steel. Because of this, you can stay assured that they are safe to wear. Previous buyers of the item have said that this product is perfectly sized. However, one user has claimed that, because the post length of the earrings is a bit long, you might find them uncomfortable when worn for a significant period of time. What is more, you will receive this pair of earrings in a licensed gift box that features the Star Trek logo. If you are not afraid to wear weird earrings, it might be a good idea to take a look at this product crafted by Star Wars Jewelry. This model is a great gift option for all those Star Wars enthusiasts that simply can’t get enough of the ‘The Force Awakens’ episode. As expected, these earrings were made from stainless steel and, consequently, they are safe to wear. Additionally, each earring measures just over ¼ inches. The seller claims that this product is suitable for ages 13 and up. If the person that you intend to buy this item for is not of the required age, it might be a better idea to invest in clip-on earrings, as they are safer. If you are a big fan of Superman, and you are not afraid to show it, the DC Comics Unisex model might be a good investment for you. These earrings are made from a hypoallergenic and nickel-free material that is safe and gentle on your skin. Each earring features the Superman logo, and it includes a very practical stainless steel screw so that the back of your ears is protected. Overall, the model has received excellent reviews – in fact, most of the buyers are happy because of the compliments that they have received when wearing the product. Another product that you should not ignore is the Amazon Collection Men’s. This unit was developed from a hypoallergenic material that is highly appreciated by current users. 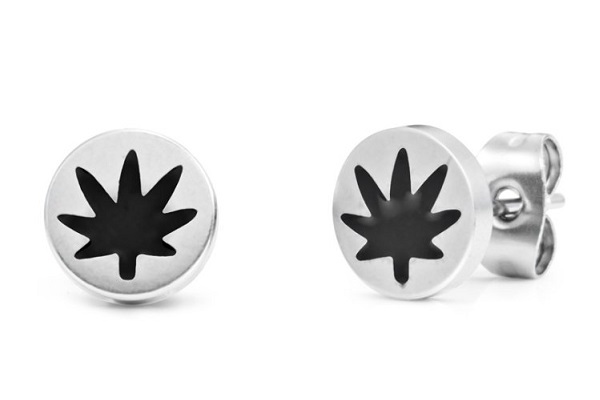 Even more so, this product includes not just one, but two pairs of earrings made from black stainless steel. Moreover, each model features a different design that was executed using simulated crystal. At the time that we have carried out our research, the product had not received a lot of reviews. Because of this, it is difficult to say what others thought of it. Still, the item has an overall good rating. Ever since ancient times men and women have found and invented new ways of making themselves more appealing or reveal their social status through body embellishments. For some tribes, rings, earrings, and piercings are still a way of living, proving their warrior souls and unique belongings. Ancient rulers – kings and pharaohs were used to wearing heavy metal jewelry to claim their economic superiority and show their divine origins. Nevertheless, modern times seem to have quit lots of ancient customs but kept the body adornment and embellishment. Jewelry is still frequently used by both men and women, emphasizing on women. Nowadays, men seem to have minimized their body jewelry and stick to classic pieces like earrings, rings, and bracelets. If you are looking to create a tough style and look as cool as possible, then you will definitely need the right pair of clip-on earrings. Luckily for you, our comprehensive guide will go through different styles and tips on how to find, and look after your favorite earrings to always keep a fashionable, yet elegant appearance! Read below to find everything you need about the coolest pairs of earrings in town and how to wear them properly. One of the most important aspects for a cool pair of men earrings is their size. You need to choose this according to your height and dimensions, as well as to your job, fashion style, etc. If you are looking for a discreet touch of elegance, you will choose dot-like earrings, barely visible from a distance. These are suitable for men who work in the corporate world, who have strict bosses or have a certain dress code they need to follow in their professional lives. Moreover, small earrings are also suitable for youngsters to be worn during classes without drawing the attention of teachers in a negative way. As open-minded as we would like to think we are, the truth is that in many cultures, male earrings are still seen as an act of rebellion, suitable mainly for teenagers and youngsters, rather than full-time adults. In fact, plenty of studies conducted pointed out that employers still have misconceptions regarding the apparel of an employee, especially regarding their body jewelry, selection of clothes or visible tattoos. Thus, if you are working in a rather strict environment and don’t want to be judged by the cover, but more for who you really are without giving up your personality and sense of style, we suggest opting for discreet earrings. These can also be easily worn by men who want to take a break from their larger pairs but don’t want their holes to heal. On the other side, larger sized items can be easily worn at specific events, parties, social events, or for casual gatherings with your friends and family. Depending on your lifestyle, job, and personal choice, you can opt for wearing largely sized earrings pretty much anytime. Another thing to take into consideration is exactly how many of your ear holes you want to fill with earrings. Often enough men choose to pierce both their earrings, but only decide to wear one earring. Other people, however, appeal to multiple earrings all over the ear lobe or stick to just one earring in each ear. Needless to say, this is only a matter of personal choice and taste, but you need to take into consideration this aspect too. Most earrings are sold in pairs but men earrings can also come separately, should you choose to wear only one. We won’t make suggestions this time either as, just like we previously stated, it is only a matter of choice. After size, the quality of the earrings is the most important aspect you need to look into. Be aware that there is a high risk of infections caused by unsterilized items which can lead to further health complications. Thus, we only suggest piercing your ears in specialized and authorized locations and to take great care of the earrings you are about to buy. We suggest purchasing items made from stainless steel, silver, gold, or platinum as they will not corrode and won’t damage your ears. However, you need to test the earrings prior to wearing them to see if you have any sorts of allergies towards certain metals. Avoid choosing plastic, wooden or other alloys as materials for your earrings because they can easily get infected. By far the most common earrings sold for men are those made from 925 sterling silver and there are countless styles to choose from. Last but not least, depending on your personal preferences, you need to choose a design that will suit you the most. Some of the most popular earrings designs for men nowadays are those with large stones, preferably diamonds. These are worn by countless celebrities, from football players to singers, NBA stars, and more. There are also countless hoop earrings encrusted with precious stones for men who like bling. If you’re more of an elegant kind of guy but don’t want to stand out through your earrings, we suggest opting for classical, small-sized items made from either platinum or silver, without diamonds or any other shiny stones. Rocker personalities are probably the happiest as they can choose from a vast array of possibilities. Skulls, crosses, animal heads, and arrows represent the most common types of earrings for men who love to show a little metal in their daily lives. Again, depending on your personal preferences, you can choose larger or smaller items. 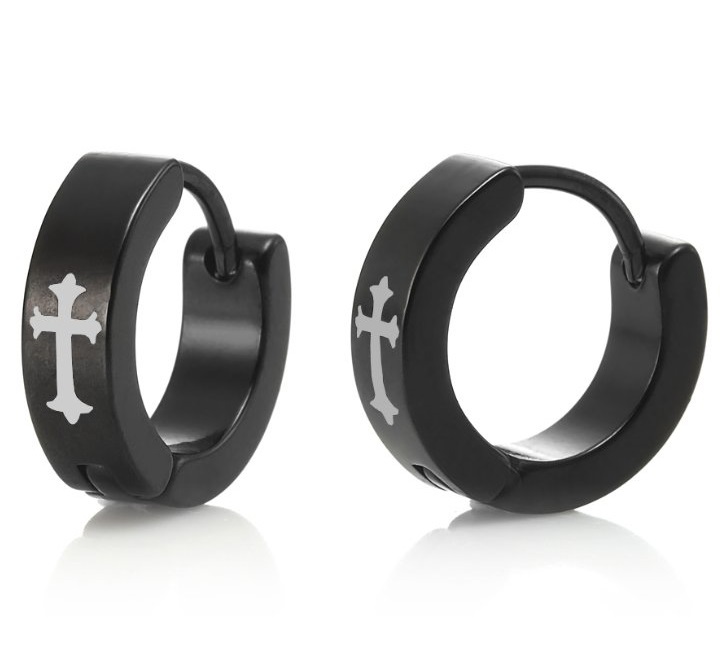 We consider the black cross earrings to be highly appropriate for religious persons and not only as a touch of personal style. These are made either from chromed silver or gold and can be purchased in a variety of sizes, shapes, and lengths.